In bringing forth its in-house Maps app along with iOS 6 – a decision that saw Google Maps ousted from the native roster – Apple oversaw what was considered to be one of the greatest tech fails of 2012. 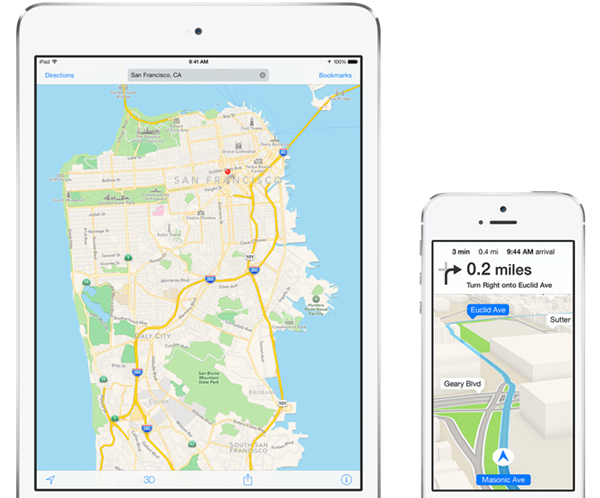 But having shaken up its iOS software development team and made a host of improvements, Maps is finally starting to look like a navigation service that folks can rely upon. 9to5Mac has word that with iOS 8, continuing the enhancement of Maps is high on the priority list, with public transport directions services being the main implementation, and beyond that, the Cupertino is also toying with the idea of integrating indoor mapping into Maps. The decision to oust Google Maps was not well-received by the iOS-using faithful, many of whom continue to stick by the third-party Maps that the Big G pushed out through popular demand. But for iOS 8, Apple Maps is in line for a few significant changes, in a move that, it is hoped, will allow it to compete with the more accomplished offering that Google has nurtured. As well as the ongoing efforts to improve the app’s data and general accuracy – which, in many parts of the world, is still abysmally bad – Apple plans to integrate public transit directions into Maps, which is something that Google Maps users take for granted on a daily basis. The ability to plan a route via public transport services – buses, trains, subways and the like – would really help to drag Maps in tune with the times. Although, at the point of iOS 8’s launch, this new feature will probably only roll out in certain major cities, it will outline Apple’s intention to improve functionality, in turn giving iOS users a legitimate reason for not simply downloading Google Maps right off the bat. The Transits view will, continues the report, accompany the Driving and Walking options, and beyond the release of iOS 8, Tim Cook’s company also plans to integrate indoor mapping into Maps. An augmented reality function, which we’ve seen already through the likes of Nokia’s notably decent HERE Maps, is also apparently being considered, although for now, the focus seems to be placed upon improving the core functionality and general performance. Having rushed iOS Maps out way too early, Apple is almost working backwards to repair its navigation app’s tattered reputation, and while these upcoming changed do look promising, you still feel as though it will be many years before Apple can — with a straight face — tout itself as a genuine competitor to Google Maps.